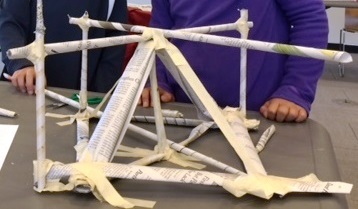 Test your understanding of which shapes are the strongest by building a newspaper table that can hold at least one heavy book without collapsing. -Collect newspapers from coworkers or library. If you want, you can either request certain sections of the newspaper (e.g. comics, sports, and classifieds), or just sort them out, so that there aren’t potentially offensive things showing up on their tables. -Build and test your own newspaper table to a) see how it works, and b) show them any strengths and deficits your own design might have, so they know what to emulate and/or avoid. What is structural engineering? Which shapes do you usually see in buildings? Which shapes are the strongest and why? Use this easy demonstration of why triangles are inherently stronger than squares. Building Big has a great interactive website that visually demonstrates these principles, but also includes domes. PBS also has a good explanation about the strength of triangles. This PBS site has a great explanation/activity about how tension and compression work. But what about building with paper? The Naked Scientists have a good explanation of how paper shapes react under heavy loads. From here, you can discuss the architectural role of columns and use a toilet paper tube to demonstrate the strength of columns. You can also use the awesome project in this PBS video for demonstration purposes (all you would need to do is make a few tall shapes out of paper in advance). It ties all of the concepts together! 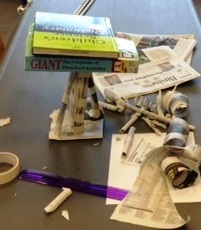 Introduce the challenge: building a table that can support at least one heavy book, is at least 8” tall, and is made out of only newspaper and the bare minimum of masking tape needed to hold it all together. Show them the table you built, and whether or not it can hold one or more heavy books. Discuss the good and bad elements of your table, making sure to point out things you recommend that they do. Offer to demonstrate the best way to roll a tube of newspaper tightly before letting them start the project (they will probably want you to after trying it on their own anyway!). This program was inspired entirely by the project on PBS Design Squad. They have even have separate project guides for parents/educators and students. Initially, we intended to give them 45 minutes for designing, building, and testing. We actually had two separate, smaller projects that they were going to vote on doing for the last 30 minutes (one was balloon towers, the other was marshmallow and toothpick structures—who can build the tallest one??). However, at the end of 45 minutes, they were nowhere near done with their tables—physically nor psychologically. They asked if they could keep going. Sure! We were careful not to tell them what the extra projects were, because we didn’t want them quitting the first project in favor of doing something else. In the end, it was much less work for us and we didn’t have to buy any extra materials. This would definitely be easier for middle and high schoolers, but no less enjoyable. They may well be able to complete it in teams in 45 minutes, and then you could move on to the (much more challenging) balloon structure building project in teams. You could possibly build newspaper tables with a younger group, but based on how our program went, it does not seem advisable. 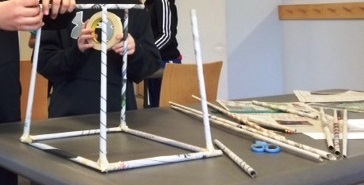 We have, however, built marshmallow and toothpick structures with 1st-3rd graders, and that went well.